Did you know that turfgrass, with or without an irrigation system, can survive a period of prolonged high heat and drought by going into dormancy? Many types of turfgrass can do this with little residual side effects other than a browned appearance, thinning, and yielding space to more tolerant weeds. Once climate conditions become more moderate with sufficient water turfgrass will be restored and produce green shoots once more. On the other hand, the same restorative response does NOT hold true with trees! Although it is true that harsh conditions will initiate a “shutdown” process, such as the closing of leaf stomates (to prevent water vapors from escaping, thus reducing moisture loss), leaf abscission (leaf drop), cladoptosis (shedding off of limbs), and reduction of root biomass, the hydration needs of trees nonetheless are far more complex than turfgrass. The volume of water needed to sustain trees plays a critical part in their survival. 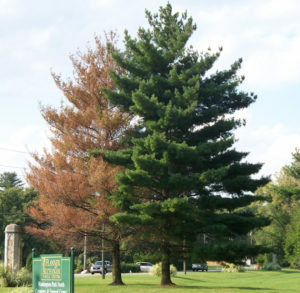 The longer a tree must endure high heat and drought without proper hydration, the more residual damage will occur to its biological system. And so, even if certain plants appear to have escaped the “Grim Reaper” this year, this does not mean they weren’t affected by the harsh climate conditions. 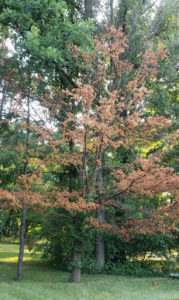 Decline and even death in some trees can occur either suddenly, slowly, or on a “biological” delay. 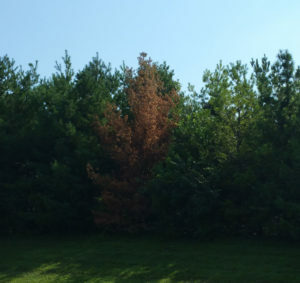 Symptoms of decline, such as stunted growth and dieback, may not become noticeable until the following year and symptoms may increase over the next several years. 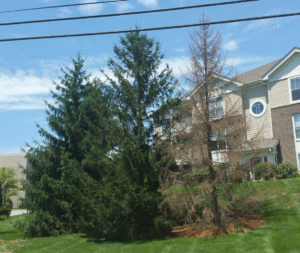 “Sudden death” is a term we use to describe the situation of a tree that looks fine one day and then suddenly dies (within hours, days, or a few short weeks) following a significant thermal climate event, such as a heatwave, and is characterized by wilted & browned leaves that are still firmly attached to their twigs. 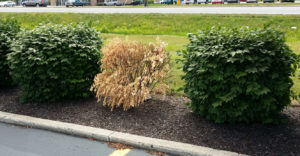 It is also not uncommon for a tree planted among its own species to seemingly die at random and for no apparent reason. The repetitive heatwaves have pushed even healthy plants to their limits! 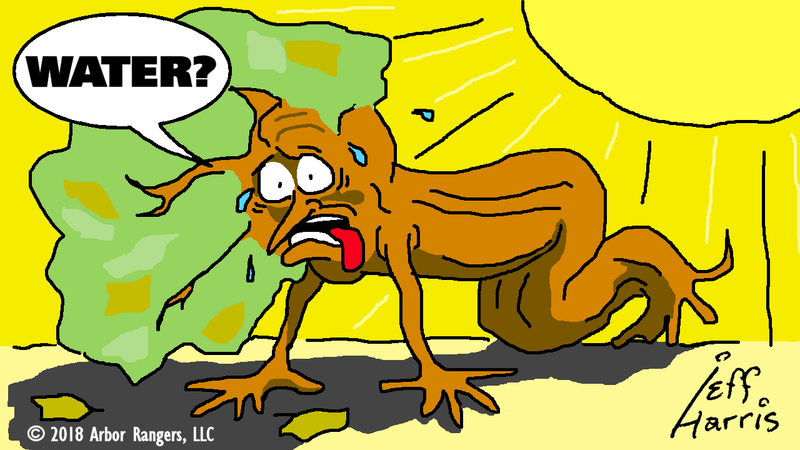 Ornamental landscape plants with even the slightest ailments are having a more difficult time coping with the heat! You may have already noticed that some trees have already lost many of their leaves. 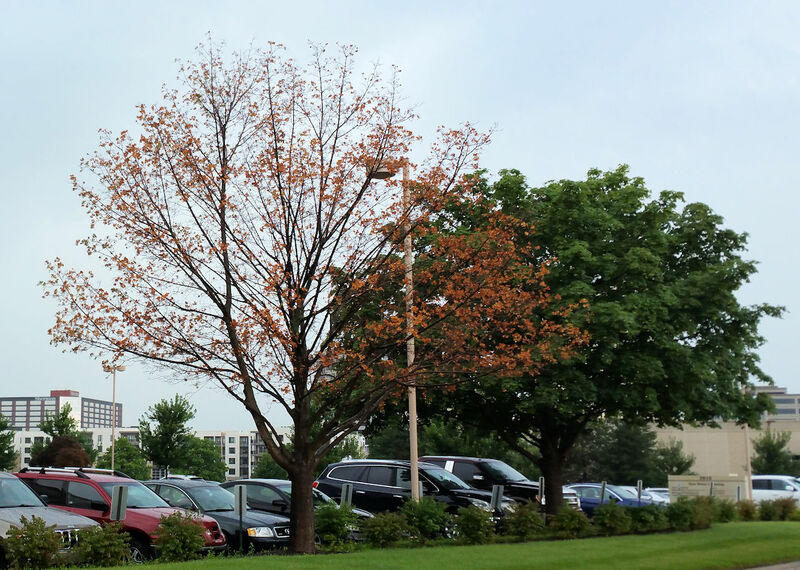 Some of these trees are suffering the results from nonlethal diseases (e.g. Apple Scab on Flowering Crabapples (see photo below), Powdery Mildew on Sycamores, Anthracnose on White Ash trees, Tubakia Leaf Spot on Oaks, etc.) or that may have suffered injury from insect feeding (e.g. Japanese Beetles on Lindens, Eastern Tent Caterpillars on Crabapples, Aphids on River Birches, White Pine Weevils on Spruce trees, etc.). 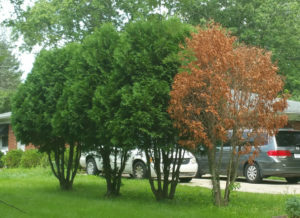 These ailment examples (and there are many others) combined with unseasonable high heat will make sick trees appear especially “ugly” (i.e. defoliated and/or “extra-crispy” looking) by early summer season onward. 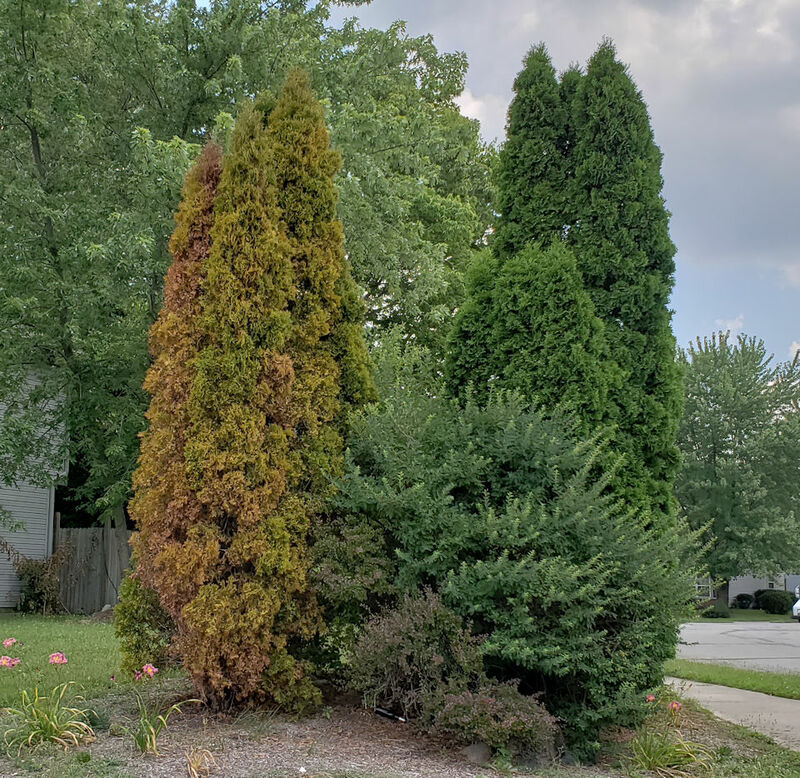 This was especially true for Indianapolis trees when temperatures lingered above 85°F into the 90’s over several days. Not too surprisingly, a few of these ill trees have not survived. Apple Scab (Venturia inaequalis) is a fungal leaf spot disease (see first inset) which causes premature leaf abscission in Malus spp. trees. 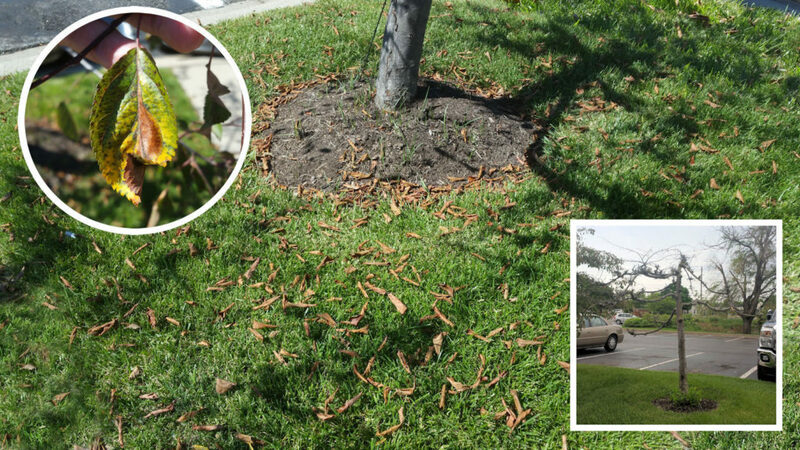 Leaf loss is more profound and severe when it is exposed to prolonged periods of intense heat and drought conditions. Eventually, the crabapple succumbs and dies (second inset). How can you protect your landscape from heat and drought? Well, one way is to simply pay close attention to drought trends, keep updated to the latest weather reports and forecasts, and by looking up historical data. It’s nearly impossible to predict the weather with 100% accuracy (because sometimes relying on weather forecasts can be a game of roulette), but by combining resources you’ll discover clues that can prepare you in managing the needs of your plants so that they receive adequate supplies of life-sustaining water during the hot & dry seasons. *Please Note: The mention of trade names or commercial products in this article is solely for the purpose of providing subject matter-related examples and do not represent, imply, nor constitute an endorsement of one brand over another. Arbor Rangers, LLC or its associates do not warrant, nor guarantee results by use of any specific name brand product in addressing your specific needs. This article may contain pesticide, equipment, and/or product type recommendations that are subject to change at any time. The recommendations are provided only as a guide. The following chart shows the unseasonably high temperatures that popped up and lingered near the end of spring and into summer in the Indianapolis area from May 15, 2018 – July 19. 2018. Included for comparison are historical averages from the National Weather Service and high temperatures recorded from 2017. As you will see from the chart below, this year Indianapolis has experienced unseasonably HOT temperatures (highlighted in yellow) and very little precipitation (highlighted in blue). Compared to last year’s temperatures, which started out unseasonably high but then registered closer to the historical averages (notable exceptions highlighted in orange), this year will definitely have a tremendous (and devastating) effect on landscape plants over the next few years. *National Weather Service Historic Daily Avg Temperature.